NOAA GOES-13 image of Sandy at 6:02 a.m. EDT Tuesday (Oct. 30). A stunning new image from space shows superstorm Sandy, now a post-tropical cyclone, still churning over the eastern United States on Tuesday (Oct. 30). NOAA's GOES-13 weather satellite captured the photo of the storm moving inland at 6:02 a.m. EDT (1302 UTC). 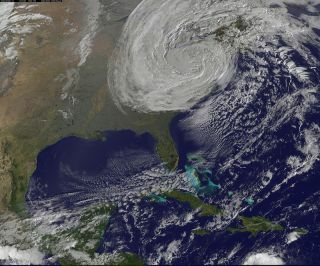 At that time, Sandy's giant swirl of clouds was covering most states east of the Mississippi River and north of Georgia. As of 11:00 a.m. Tuesday, Sandy was centered about 120 miles (190 kilometers) east-southeast of Pittsburgh, slowly moving westward and weakening over Pennsylvania, according to the National Hurricane Center (NHC) in Miami. The storm's maximum sustained winds were 45 mph (72 kph), down from 90 mph (150 kph) Monday when it was a Category 1 hurricane. Sandy made landfall on the East Coast Monday and has already left record damage in its wake — historic flooding, at least a dozen dead, and millions without power from North Carolina to Maine. Click here for the latest news and complete coverage of Sandy.